Last night DemoCamp10 was held at the MaRS discovery district here in Toronto. I think it could be best described as, well “different”. It was certainly the least consumer oriented set of Demos I can remember seeing, with the exception of Quotiki.com’s demo there wasn’t the typical parade of AJAX’y/Web 2.0/”next big thing” positioned applications that one usually expects to see at a DemoCamp. That’s not to say it was a bad thing, just different. The first demo of the night was a marking tool that some UofT students created as a project. It allows TA’s and Professors to access files submitted by students. They can then review the file and highlight text, add comments and score the paper/code based on a set of predetermined criteria. It was actually quite an impressive application and it quickly became clear there were probably a lot of non-educational uses for components of the system as well. Second up was quotiki.com, one of the aforementioned AJAX’y/Web 2.0 type sites that was essentially presented as the “Digg of Quotes”. It’s an interesting and well designed site but even they admitted that it needs some “filling out” in terms of features. At some point someone asked the question “Why?” – which I think is fair. At the end of the day quotes are interesting and all but is there really a business model there? Likely not but I still think they could run this as a pretty interesting niche site but it likely won’t ever move beyond a good hobby site. It’s certainly worth taking a look at though. The third presenter of the evening, well, unfortunately he missed the “Demo” part of the equation. I feel bad for the guy a bit because I think it’s one of those things that kept getting worse and he couldn’t figure out how to get away from it. It felt like an exceptionally long fifteen minutes – although I imagine it felt a lot longer for him. The fourth presenter I was a bit unsure about at first – he started live coding a tic tac toe game – not having much experience with PHP it was interesting to see someone writing it in real time but I was worried that the crowd was going to crucify him if all he was going to do was code a simple game of tic tac toe in front of them, especially after the last guy. In the end though it ended up being an interesting demo, the game didn’t matter at all but some of the stuff he put into that demo was pretty interesting. For example the first user to the site would be assigned as “X”, the second visitor (different browser/computer) would automatically be assigned “O” – they could then play each other in a linked game. On the surface it looked pretty basic but as he described it you could see the coders in the room begin to light up. All in all an interesting night. 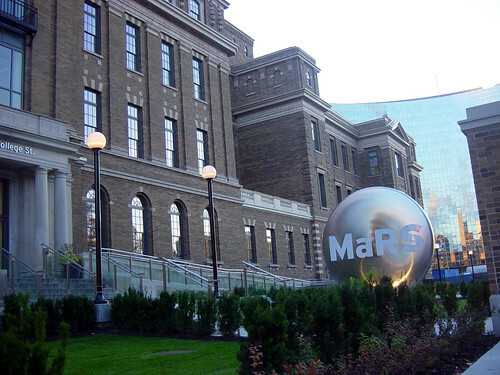 DemoCamp11 will be on November 20th at the MaRS complex. Be sure to sign up if you’re interested and come introduce yourself if you do come out.